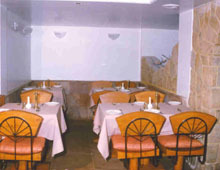 K.T 'S AGORA RESTAURANT :Conveniently situated very near Vasai (West) railway station.Established in 1996. It has a garden restaurant with centrally fitted Air Condition. It has a seating capacity of 75 persons inside. It has conference facilities and an open air garden which can seat about 200 persons outside. KT’s Agora is the only Resturant in town run very efficiently by K. T. Management, with all type of comforts which you need in your daily life.We have the faclities of a big Hall and beautiful green garden to arrange parties and business conference, Ice-Cream parlour Yankee Doodle, Fountain pipes Counter & For children we are having Coins operating games. K.T.’s Agora is the only Vegetatrian/ Resturant. Serving all types of food like Indian Chinese and Punjabi food.